"We are ill-equipped, historically and psychologically, to understand it, which is one of the reasons why so many refuse to accept that it is happening." Who is George referencing, when he 'says', "we"? This is no CAGW Armageddon scenario George........... except in your tiny mind Mr. Monbiot. Shock horror, refreeze due, lights out in the North, no lights on in the Guardian building. Aug 28, 2012 at 9:01 PM | Athelstan. Is this how our children will see it: that we destroyed the benign conditions that made our world of wonders possible, and then used the opportunity to amplify the damage? Our world of wonders. I like that. Far more resilient than Monbiot is able to dream, that's all. Any anger we might feel about such immature misreading of the Arctic annual cycle in the context of entirely precedented global sea ice levels shouldn't obscure the unity we have on the wonders of today. And a greater sense of gratitude for the resilience we rightly see is surely required from every rational optimist. Did I miss something? Won't all the ice freeze up again when winter comes? So the whole shebang starts over again next spring from about where it started this year. If so, WTF is all the big fuss about? As always at the Guardian, the commenters do not have the self-awareness to see what is obvious to any passing observer, that it's really all about their deep psychological need to feel more enlightened and virtuous than other people. If you look at the most extreme, and least reliable of a number of data sets it is. Otherwise it ain't. Anthony Watts give the full analysis. Thanks, ManicB. So the real story begins with a massive storm in the central Arctic Ocean on 4-8 August. Strangely Monbiot doesn't mention it. Does he even know about it? Monbiot is just regurgitating the "skeptics are in denial" meme. It's old, but his readers never tire of hearing it. I don't think the storm was that unusual, I think we probably do have an unusually low ice extent in the context of the last 33 years. Which is of course not that long a time period, but you get called rude names in some places for pointing that out. 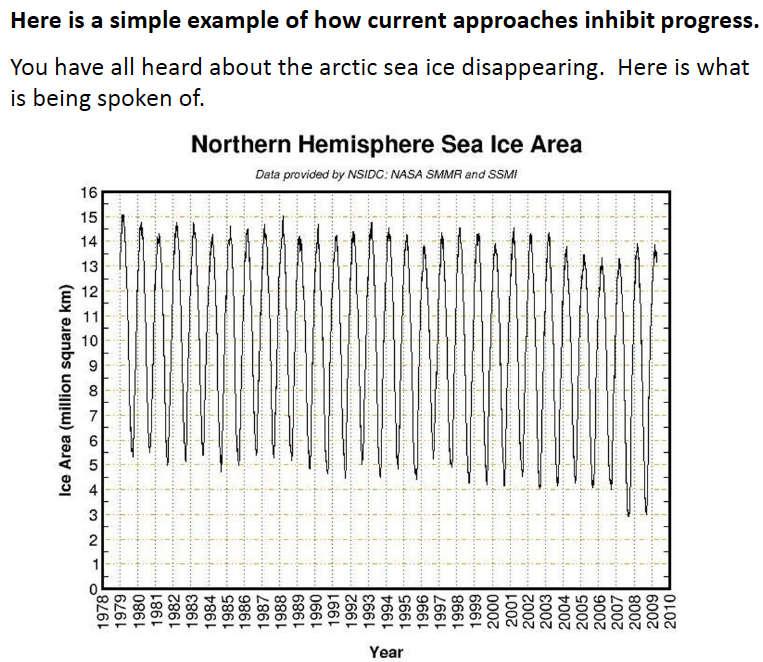 There is also the satellite data going further back than 1979 in the IPCC first assessment report (FAR), page 223 or something like that. Not sure why it wasn't included in later IPCC reports, possibly a legitimate reason. I note that this is the only mention on the front page - indeed, the first 2 pages - of this blog that the Arctic sea-ice record has just collapsed - and that's the only word for it. Did you also note the Greenland melt? I know it's much more satisfactory to deride people - this obsession with Mann is truly creepy; is it because you weren't mentioned in his book? - which is about all you guys ever seem to do, but is there really any bigger news in climate than either of these issues? You can't even muster a refutation - it's 'hey, let's all just ignore the big thawing mammoth in the room'! Can't even muster a post on some 'natural cycles' blather? Do you have any idea how ridiculous you look? Miss your meds today Bill? The alarmists are getting truly desperate about the Arctic. There has been an unusual low pressure system - high winds. This broke up the ice to below the passive detection limit [diffraction limited], so the low ice level is an artefact. The corresponding evidence is temperature, quite low. As for Greenland, a one day event which is a regular occurrence. You mean the 34-year Arctic sea ice record? Do you ever point out what an amazing slice of luck it is for humanity that these 34 years are exactly the point when the sea ice 'collapses' compared to its extent for hundreds and thousands of years? Because isn't that the implication of what you're saying? ... a really important point is that the case for alarm would still be weak even if anthropogenic global warming were significant. Polar bears, arctic summer sea ice, regional droughts and floods, coral bleaching, hurricanes, alpine glaciers, malaria, etc. etc. all depend not on some global average of surface temperature anomaly, but on a huge number of regional variables including temperature, humidity, cloud cover, precipitation, and direction and magnitude of wind. The state of the ocean is also often crucial. Our ability to forecast any of these over periods beyond a few days is minimal (a leading modeler refers to it as essentially guesswork). Yet, each catastrophic forecast depends on each of these being in a specific range. The odds of any specific catastrophe actually occurring are almost zero. The Arctic ocean is warming up, icebergs are growing scarcer and in some places the seals are finding the water too hot. Reports all point to a radical change in climate conditions and hitherto unheard-of temperatures in the Arctic zone. Expeditions report that scarcely any ice has been met with as far north as 81 degrees 29 minutes. Great masses of ice have been replaced by moraines of earth and stones, while at many points well known glaciers have entirely disappeared. In the following months, Skate, as the first ship of her class, conducted various tests in the vicinity of her home port. In early March 1959, she again headed for the Arctic to pioneer operations during the period of extreme cold and maximum ice thickness. The submarine steamed 3,900 miles (6,300 km) under pack ice while surfacing through it ten times. On 17 March, she surfaced at the North Pole to commit the ashes of the famed explorer Sir Hubert Wilkins to the Arctic waste. For these and many other reasons we sceptics feel that words like "collapsed" are ridiculous, as are the greater woes predicted by George Monbiot on the back of latest figures, which the assembled brains at Watts Up With That make clear come with considerable variation and uncertainty. That doesn't mean we don't have things to learn. And I take you back to one phrase from Monbiot that I liked a great deal from the moment I read it: our world of wonders. That it is. Before attacking one another I believe it's good to agree on that point. And perhaps read Listening to Complainers Is Bad for Your Brain from Inc.com last week. That could profit any of us. Poor old George. When he starts talking about atmospheric physics, you know he is out of his scientific depth. They say a little knowledge is dangerous and George has very little knowledge, so he is a danger to himself. He must have sleepless nights worrying about the planet. Still not much of a robust discussion, is it? Why do I picture you guys all standing around, scrupulously examining your footwear in order to avoid eye-contact? Oh, and now it's the dear old USS Skate. What, this one? The date was 11 August 1958 and the Skate had just become the first submarine to surface at the North Pole. "Is this how our children will see it: that we destroyed the benign conditions that made our world of wonders possible, and then used the opportunity to amplify the damage?" Hasn't George heard of Nature raw in tooth and claw? Hasn't he heard of the five mass extinctions in earth's history? Hasn't he read about the near extinction of our ancestors 1 million years ago? Earth has never been benign, George is just very lucky to be alive now, he should stop whining and make the most of his luck. Bill: I didn't mention 1958. No doubt there was more ice that year than the next but so what? One of Lindzen's key points is that it's impossible to predict such variables more than a few days ahead. Thus in 1957, when there was very little ice, they couldn't have known about the apparent bounce back in 58, nor the decrease again in 59. Too many variables within a system exhibiting spatio-temporal chaos. And all before man-made CO2 is said to have had its effect. So why the abuse and ridicule? You didn't forecast the August 2012 extent five years back, did you? Or perhaps you did. Would you like to give us now your forecast of the minimum extent of Arctic summer sea ice in 2013, 2014, 2015, 2016 and 2017? We'd love to check that out. And then there's the matter of whether it's a blessing or a curse to mankind as a whole for the summer minimum to decrease. Whatever Monbiot writes we don't see clear cut proof that calamity is around the corner because of the current direction of this singular stat. Deaths from extreme events have been falling since the 1920s. How do we know that this statistics too won't continue in a downward direction? If so, let's go after malaria and other scourges of mankind and be grateful for our resilience in the climate area. Bill, if you'd read our host's book you'd understand why we're a bit skeptical of hockey stick papers like Kinnord et al. The GISP2 ice core data I linked to above suggests that temperatures in the arctic region have been much higher than today several times during the holocene, including during the period of the Kinnord study. This also ties in with historical evidence such as that provided by the Vikings. And before you go back to your favourite sites where that style of sarcasm, caricature of your opponents' arguments, dripping contempt, name-calling etc. is the norm, I suggest you read my first comment on this thread - self-awareness is the first step. "What we are seeing, here and now, is the transformation of the atmospheric physics of this planet." "the transformation of the atmospheric physics"
George has transformed to the Euler angles. As a rigid body it makes his Lagrangian more tractable. No problem, give it a couple of weeks and he'll retract it. It's how he rolls, once he's been paid. @Bill, less than 6000 years ago trees grew to the edge of the Arctic Ocean. Today they are 200-400 kms to the South. Basically what it means is that the Arctic was 2-3 degrees (on average) warmer than today. No runaway Global warming from methane release from melting permafrost, no extinction of Polar Bears. No SUVs and fossil-fuel economy either. PS before the AGW religion sprung up with its doom-laden and wailing acolytes- like you, this period was called the Holocene Climatic Optimum- and with good reason.- It's been largely downhill since with a few ever-smaller upticks, the current one been the smallest. Oops I meant Kinnard not Kinnord. Is Moonbat a congenital idiot, or is his idiocy acquired? The never ending debate between "nature" and nurture". According to those who lap up the"Gruaniard's" bile, it is undoubtedly "nurture". Yesterday was August 28th 2012. Remember that date. It marks the day when the world went raving mad... When your children ask how and why it all went so wrong, point them to yesterday's date, and explain that the world is not led by rational people. "point them to yesterday's date, and explain that the world is not led by rational people"